The shock waves are reverberating around the world following the announcement that the Parliamentary Private Secretary to the Defence Secretary had resigned citing the strategy being adopted in the war in Afghanistan. Survivors at Westminster, the epicentre of the political explosion, were first to comment. Further afield the news has been received with shock, bewilderment and genuine concern for the future of Britain's role in Afghanistan. 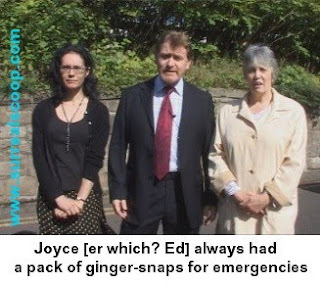 The Ministry of Defence denied that Mr Joyce's departure would have a serious impact on Britain's war effort, but conceded that an emergency re-shuffle had been undertaken to ensure that the Defence Secretary's office continued to run smoothly. Despite assertions from the government that it is business as usual, Joyce’s decade of experience at assisting secretaries will certainly be missed in Whitehall and will be felt in Afghanistan. The effects of Joyce’s resignation have been felt as far away as Washington, where Defence Secretary Bob Ainsworth hosted a dinner last night in honour of the 1000th newspaper headline celebrating a remarkably low number of troop deaths for an armed military invasion. Following the shock resignation, Joyce was said by friends to be coping well and has spent the last few days helping with planning for a church fete in Perth. Perth? He may be a Scottish MP for a constituency in Scotland, but he is more likely to be at a fete in Kent! And pity the poor church picking up his expenses bill!